Jan Kauffman will be the featured artist at the Ninepipes Museum of Early Montana on Saturday, Oct. 7. CHARLO – Visitors to the Ninepipes Museum of Early Montana on Saturday, Oct. 7, are in for a real treat. Jan Kauffman will be our featured artist at the October “First Saturday” exhibit from 10 a.m.-4 p.m. showcasing a number of her oil paintings as well as pine-needle and sweet grass woven baskets. Jan Kauffman completed her first oil painting at age 16 for her grandmother. Looking at the painting today reminds Jan how far she has come in her artwork since her childhood on a farm in North Dakota. Jan and her mother and father, Louis and Elizabeth Des Jarlais, brothers, Del, Rick, Doug, Ron, and Gary moved to Ronan in 1969, where she’s lived ever since. She’s created many oil paintings over the years to give as gifts and has donated to many community organizations, such as Foundation for North American Wild Sheep (FNAWS), Pheasants Forever, Lake County Festival of Trees, and currently paints for Sportsmen for Wildlife. Having recently retired from banking in 2015, Jan knew that art was her future goal. She is presently taking lessons from Olivia Olson, and will be taking lessons from Diana Neville Knowles from Bigfork as soon as Diana has a spot for her. Diana is an accomplished portrait artist and teacher and has encouraged Jan to place her paintings in Bigfork. In early October, Jan will start placing three oil paintings at a time in the Bigfork Museum of Arts and History gift shop. 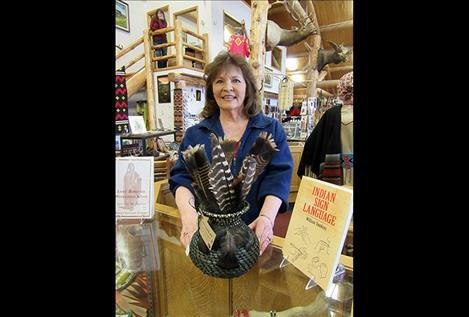 Her goal is to display and sell in the Bigfork area as well as locally. This talented lady recently took up pine-needle basketry and is creating some beautiful pieces using local ponderosa pine. She dyes some of the needles and adds whitetail antlers. Jan always has a new basket in mind and is experimenting with weaving sinew into her baskets. She has also created a number of baskets using sweet grass. Stop by to visit with Jan and enjoy a few light refreshments at this reception. The museum is open 9 a.m.-5 p.m. Mondays through Saturdays through Oct. 31, and the gift shop’s end-of-season sale runs from Oct. 16-28 with many great discounts offered. The drawing for two raffle items, a Jackson Sundown commemorative Pendleton blanket and an original painting by Marjorie Harper, is scheduled for 3 p.m. Saturday, Oct. 28. The museum is available for group and school tours year-round, so call 406-644-3435 if you have family or a group of business associates you would like to have tour the museum.